*Take 694East to exit 37 for MN47/University Avenue. Keep right and merge onto MN47. Turn left on Lowry Avenue NE. Turn right onto Central Avenue NE. Turn right onto 14th Ave.
Head north on I-35W. Take Exit 19 (East Hennepin Ave.). Stay on Johnson Street NE to Broadway Street NE. Take a Left on Broadway Street NE. Go to Central Ave. E and take a Right. Go to the first light, which is 14th Ave. NE. Take a Left. Take 94-W to 280. Take 280 to Broadway Street. Take a Left on Broadway Street. Follow Broadway until Central Ave. E, take a Right. Go to the first light, which is 14th Ave. NE. Take a Left. Take 394E to 94W. Exit onto Broadway Street. Take a Right on Broadway. Take Broadway up to Central, Take a Left on Central. Go to the first light, which is 14th Ave. NE. Take a Left. 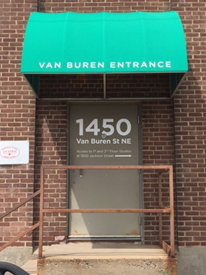 Use the entrance to the Northrup King building at 1450 Van Buren Street NE. Do not enter Northrup King Building into gps because it will take you to the main entrance instead of the one closest to our office. Please enter the Van Buren St NE address. — See photo below. Come up two flights of stairs to the second floor. Turn right, then left, and follow that hallway. Go to the end of the hallway and then turn left (that is your only option). 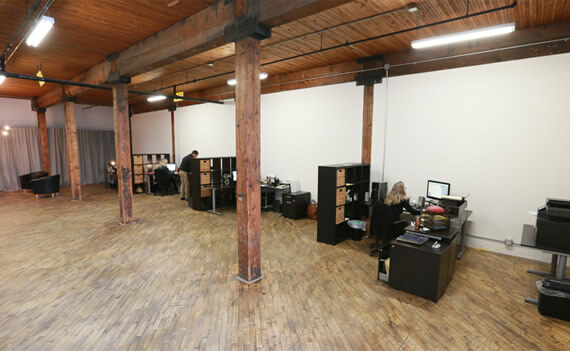 On your left you will see double gray doors – that is our office – Studio 218!